A group of band geeks becomes fascinated with and befriend an odd kid named Jeff Dahmer, who likes to fake epileptic fits for attention. It's not every day you see a coming-of-age film about one of America's most notorious serial killers. "My Friend Dahmer" is written and directed by Marc Meyers and is based on the graphic novel of the same name by John "Derf" Backderf. He was a classmate of Jeffrey Dahmer's back in high school. If you went to school with a person who murdered and cannibalized at least 17 people, some may ask the question, "what was it like going to school with that guy before he murdered and cannibalized at least 17 people?" Well, this is that story. 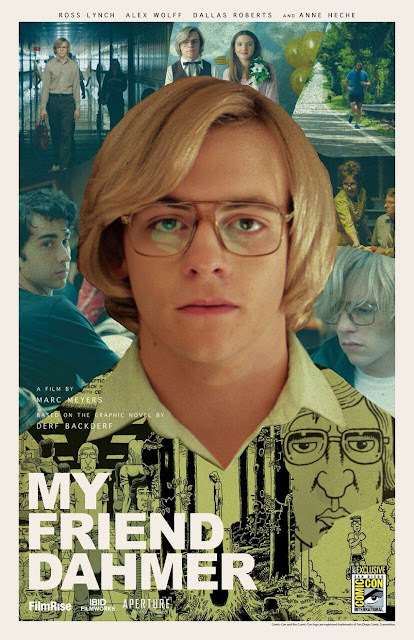 The film stars Ross Lynch as Jeffery Dahmer, who back then was simply an awkward kid with a rough home life. We see how tough it was for Jeff living with parents, played by Anne Heche and Dallas Roberts, who endlessly argued. A lot of these arguments seem to be spawned from his mother's instability and her own battles with various forms of psychosis. One day, Dahmer starts acting like a 'spazz,' faking epileptic seizures and mocking a local decorator who has cerebral palsy. Keep in mind, this took place back in the 70's, and to a bunch of tactless teenagers growing up in that era, they found these impersonations to be hilarious. His actions gained the attention of a group of band geeks who formed the Jeff Dahmer Fan Club, led by aforementioned author Derf Backderf, played here by Alex Wolff. One may have conflicting emotions watching a movie like "My Friend Dahmer," and rightfully so. It often has a comedic tone to it, which may make some viewers uncomfortable since we are looking at these situations in hindsight knowing what a monster Dahmer actually turned out to be. There are numerous awkward and uncomfortable moments where the audience is left waiting for this clearly crazy and unwell person to completely snap. Though it is meant to offer a bit of insight into Dahmer's life, it also wants to help us understand how easy it is to miss the warning signs of psychopathy. To his classmates and friends, Dahmer was just a weirdo freak and a bit of a goofball who did crazy things for attention. What they didn't really realize is his clownish behavior was just a mask to hide the darker desires he kept repressed by numbing himself with large quantities of alcohol. We start to see how other kids like Derf and his friends may gravitate towards a guy like Dahmer. We as an audience often laugh at the stuff Jeff does. We can even empathize and sympathize with how poorly he is treated by others, but then, a thought will creep up in your mind, saying, "oh yeah, this guy is a crazy murderer and eats human people. I shouldn't really feel bad for him or laugh at his antics." It's an interesting position to be in and it may be one that Derf has struggled to understand for many years. We found ourselves wondering if Derf or any of the others in the Dahmer Fan Club have reflected on their time in high school with this serial killer and have wondered if there was anything they could have done that may have changed the trajectory of Dahmer's life. This story seem like a way to visualize that refection. "My Friend Dahmer" is an interesting film about obsession, popularity, and mental illness that will make you think about things you may have never considered about the pasts of serial killers. It has an excellent, creepy, unsettling performance from Ross Lynch and a smaller but worthy role by Alex Wolff. Though the tone can be jarring at times, it still made us think and squirm equally.